Big show from a great bunch of cool folks. We are the Philadelphia Dumpster Divers. The images below are of works by yours truly, Burnell Yow!, one of the members of this wild and wacky group. The pieces depicted will be viewable and available to purchase during the course of the event. Scroll down for more info and a list of the artists participating. Who are The Dumpster Divers of Philadelphia? They are a group of over 40 found object artists, meeting monthly to socialize with fellow art eccentrics, share trash-picked finds, art-making, stories, field trip and flea market news and exhibit announcements. 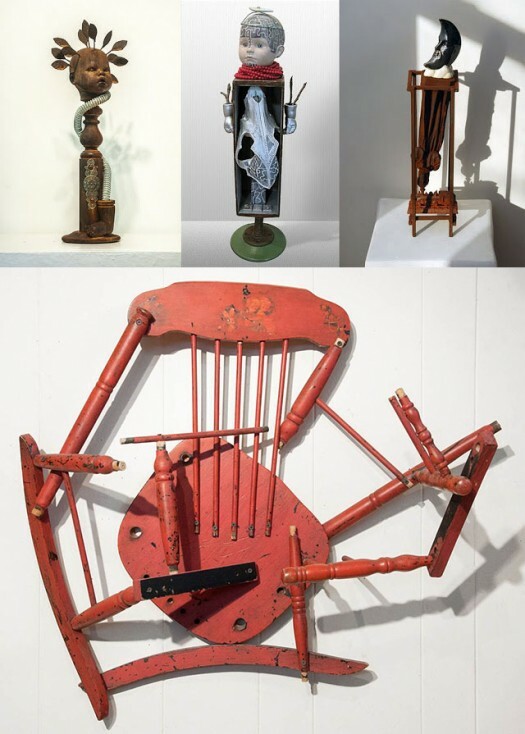 This major group exhibition will show how found objects inspire artists to create figures, masks, political statements, abstract assemblages, still life, works of art contained in boxes, and art used for story-telling or function. Their artwork is as diverse as the group and as the materials used. All of it is engaging, often playful, sometimes political, ironic and definitely delightful. Artists participating in this event: Betsy Alexander, Gretchen Altabef, Sara Benowitz, Neil Benson, Alden Cole, Carol Cole, Randy Dalton, James Dupree, Dan Enright, Charna Eisner, Joanne Hoffman, Hugo Hsu, John Jonik, Ann Keech, Diane Keller, Leslie Matthews, Susan Moloney, Taji R. Nahl, Eva Preston, Susan Richards, Leo Sewell, Ellen Sall, Joel Spivak, Jim Ulrich, Sally Willowbee and Burnell YOW! Special thanks to Ann Keech for organizing this event. And to Lauralynn White, gallery director.